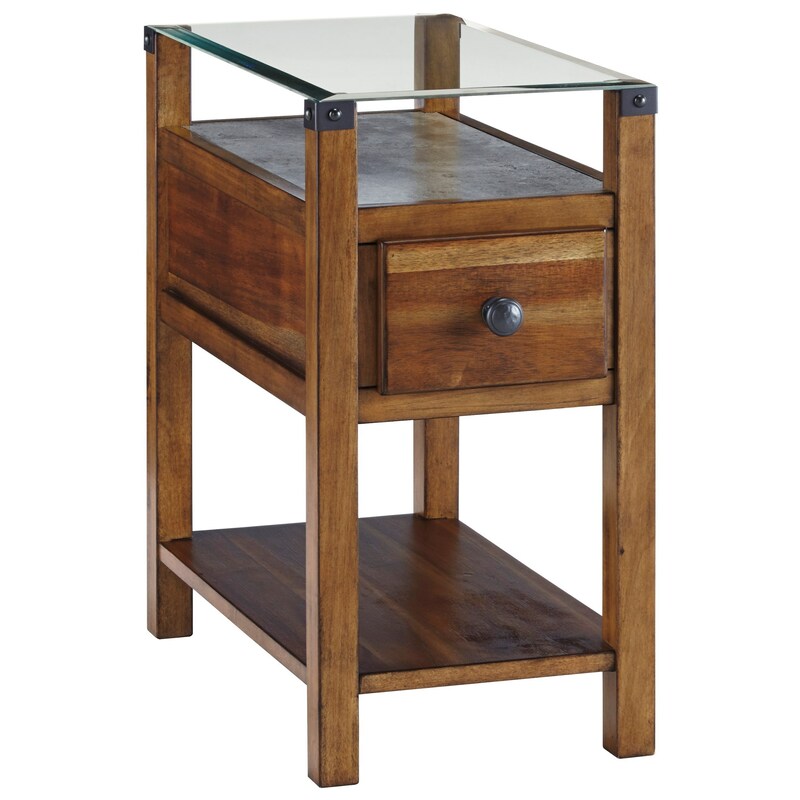 This chair side end table pairs a medium brown finish over wood veneers and solids with a simple glass top and industrial style corner brackets. The table also offers a concrete look upper shelf, drawer, and additional lower shelf. The back of the table has built-in outlets and USB charging ports for a convenient place to plug in your devices. The Diamenton Medium Brown Chair Side End Table with Glass Top and Faux Concrete Shelf by Signature Design by Ashley at Simply Home by Lindy's in the Hickory, Morganton, Lenoir area. Product availability may vary. Contact us for the most current availability on this product. Storage Top opening 12.25" x 22.25" x 3.50". Bottom opening 12.25" x 22.25" x 8.50". Drawer interior 6.25" x 16.63" x 3.75". Built-in outlets and USB charging ports offer updated functionality to the chair side tables available from this collection. Choose from several color options available to best fit your home's decor. The Diamenton collection is a great option if you are looking for Contemporary furniture in the Hickory, Morganton, Lenoir area. Browse other items in the Diamenton collection from Simply Home by Lindy's in the Hickory, Morganton, Lenoir area.